2018 Honda CRV or 2018 Mazda CX5? Will be needing a vehicle soon for the family when my Teenage son starts driving soon. I currently own a 2007 Honda CRV and despite the recalls, I have been happy with it all these years for it's reliability and versatility. So we will be in the market for another vehicle next year and have been debating if I should go for the new CRV or go with the new CX5. When the dealer gave us a loaner car, while the airbags for my CRV was on order, they gave us a 2015 Mazda CX5. It was pretty sparse in options, but found it fun to drive and quickly familiar with the way the vehicle performed. Like getting in a car we've own for years and quickly felt confident driving it. After 5 months of driving the CX5, the parts for the CRV arrived and I was surprised that I found myself sad to return the CX5. My wife and I actually grew fond of it. But getting the old CRV back was not too bad, in fact I am more excited about the features of the current generation with its turbo engine. What are most readers thoughts between the 2 models in their latest generations? Which would you go for and why? Is the new turbo engine going to be reliable in the long run if I go with the Honda? I think you need to drive the new CRV for a fair comparison. I think you will be shocked at how much they have improved since 2007. I have a 2016 EX-L with 26,000 troublefree miles on it and I like it a lot. If I had known of the many changes and improvements that the 2017 has, I would have waited. I would lean toward the CRV because because they are so popular, replacement and aftermarket parts are more readily available and cheaper. It also has more space inside, gets better fuel economy and has a higher resale value. I haven't driven either new model, so I can't speak for one over the other. I did try the 2015 CX-5 before buying my CR-V- while I liked the way the CX-5 drove better, I ended up with the latter mainly because the interior was much better (down to leather on the front console box/armrest, versus plastic in the Mazda). Mazda upped the interior materials in the 2016 model (including adding leather to the armrest), and even more so with the latest version (especially the top trims). I think both offer compelling packages, but Mazda is supposed to be coming out with a diesel version at the end of this year. I drive a ton, so I am eyeing that to see how it turns out (and maybe that will be my next car if I like it enough). In a general sense I have always found the Mazda to be more fun driving and better handling. The early Mazda's has some input from Lotus, a top notch suspension source but this may not suit everyone. It sounds like to me you like the feel tho. Some prefer an old catallac which would drive me crazy but to each their own. I have been researching these models TO DEATH as I am also in the market for a new car with emphasis on RELIABILITY. Honda's are known for nothing if not reliability. No, they aren't particularly a blast to drive, but keeping one for 15 years is not atypical. BUT, I also would never buy another car with turbo. I didn't realize how hard turbo is on an engine and that it is not intended to last more than 100-110,000 miles. I just replaced mine and it was painful. I like my CR-V and it can get really great milage. I have not had it long enough to learn the specifics of getting the Maximum Milage from our 1.5 Turbo, but I can get up to 49.1 on a 15 mile one way trip we take one or two times a week. 49.1 has been the best and we usually get over 48 on that one trip. The lowest milage on a 15 minute trip was about 35 MPG. I find that just about 60 MPH is the tipping point but does great any where in the 50 + range. I buy gas at the same station all the time so I don't know about other brands, good or bad. Our longest trip so far is about 1.5 hours long and the two trips this length have givem me 48.1 and 44.5 MPG. We live in a Mountainous area and about 15 minutes of those trips is City driving. The ride is pretty good, much better than our 2014 CR-V and the noise is much better. The seats are also more comfortable. The cruise control is absolutely wonderful, stays within one MPH 90% of the time. As I learn more about how to drive this car I will come back here and tell you what I have found. That one and half ltier turbo-4 is the sweet spot for a small economy car or cuv. Our Buick Encore would see almost 40 mpg at 60 mph....with AWD. Our latest Buick Envision Prem ll with 2.0T can only muster 32 mpg on a 26 mpg highway rating. It gets 30 mpg fully loaded which is still good but might need some more break in miles. I see the CX-5 doesn't make the 30 mpg EPA mark so it is far the worst for highway efficency. You should weigh that into your decision but I believe the Mazda will be less expensive to purchase as the Honda is the most expensive cuv you can buy today. A 2018 Equinox 1.5t AWD is $21K while the CR-V 1.5t AWD is $26K, or $5,000 more expensive on cars.com I challenge you to find $5,000 difference in the over priced Honda. A number of our members have reported this oil dilution issue. It is not yet clear how it will play out. I do wonder why this problem only affects the CR-V, and not Civics and Accords that use the same basic engine. A friend informed me about the oil and dilution problem on the new CRV's with the turbo engine. It was a deal breaker and I may just go with the base LX model with the normally aspirated 2.4 engine if the 2019 Toyota RAV4 has a disappointing review but it's in my short list. It's a shame Honda has not acknowledged the fuel and oil issues. I'm still on the fence with the CX5. Mike, yes I believe all Honda 1.5 turbos have the dilution issues. My 2014 2.5 Naturally Aspitated went about 10K on an oil change. I have always assumed that a "Turbo" needed the oil changed much sooner. This is one of the reasons that I had not purchased aTurbo before. This was a spur of the moment purchase because we liked the more quiet and comfortable ride over our 2014. If I were going to complain about something, it would be the Cruise Control shut off so close to the set button. I ofter turn off the Cruise when I meant to set it. For some reason all of the reports we've received of oil dilution with the Honda 1.5T have been for the CR-V.
Looks to close to half a million recalled as of May in China and only CR-V's. 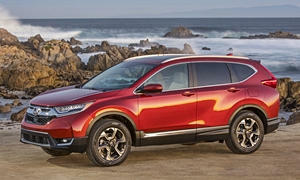 Each of the CR-V forums are also reporting rising oil levels in North America too. Honda Motor Co Ltd will recall roughly 350,000 vehicles in China to resolve a cold-climate engine issue and quell a barrage of customer complaints that has hit the automaker over the past month.